Normally, I don’t touch on a lot of science here, but this recent paleological find is too important to ignore. Just this week, paleontologists (i.e.—”dinosaur scientists”) have announced the finding of soft tissue in the fossilized remains of a T. Rex dated at 70 million years old. This extraordinary discovery may actually slam closed the issue of whether dinosaurs were warm-blooded or not. In a Jurassic Park-like side note, there may actually be genetic material that can be analyzed in the tissue. 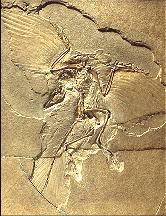 But what is important about this—at least to young Earth creationists—is the fact that this find violates common theories used by Darwinists to explain fossilization. Not only that, but it calls into question how soft tissue can survive for 7o million years. Perhaps it’s not truly millions of years old. The sad part is that this is not being noted. It’s the dirty little secret that the Darwinists don’t want to entertain, even if it is staring them in the face. So let’s let time reveal how this discovery plays out. It could be fascinating for Bible-believing Christians who ascribe to young Earth creation models.